Most of the rural communities in low-income countries are isolated from the mainstream national economy and suffer numerous deprivations that impact the quality of life of their inhabitants. Poor infrastructure, degraded local natural resources and inadequate linkage to markets combine to create a poverty trap which village economies usually find difficult to escape. While there are probably no simple interventions or ‘silver bullets’, that could enable the rural communities to break out of asystemic traps of poverty and deprivation, it is possible to devise relatively simple packages of processes and practices that promote triple bottom wellbeing for a small initial investment. Such packages and practices can set the village economy onto a new trajectory of socio-economic development that sustains itself into the future. The current development strategy follows a siloed approach that fails to capitalise on the principle of the whole being more than the sum of its parts. Development Alternatives village development programme – Hamara Gaon (an etymology that emphasises people’s right to decide their development pathway as informed and empowered communities) targets issues related to the economy, environment and society systemically, as a whole, helping communities realise the benefit of integrated development. Embedded in holistic and sustainable thinking, the programme inspires ownership amongst the villagers, designs rational environmental management systems, promotes diversified and dynamic local economies and fosters social harmony. This is catalysed through the creation of people-oriented institutions, dissemination of knowledge and appropriate technologies, strengthening local governance systems, and enabling access to credit and finance. The initiative is based on the principle of people’s participation, equity, and promotion of community owned and managed systems approach to achieve sustainable impact and replication. It aims to introduce a holistic package of interventions to transform lives of the marginalised and vulnerable through establishment of infrastructure and institutions that enable social and economic prosperity for all in harmony with nature. Capacities of local institutions are strengthened to plan and implement a range of integrated village development measures by accessing available government schemes. These include – integrated watershed management, infrastructure development such as roads, drains, housing, water supply, sanitation and electrification, literacy and livelihood initiatives, savings and credit services and farm and off farm enterprises identified on the basis of resource and market assessments, communication and information. Led through local institutions and engagement with local government the project converges with resources from public schemes and local development action. Wherever possible it seeks private investment and partnerships with community groups to leverage resources and instil sustainability in development. 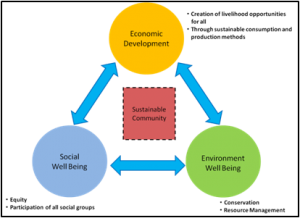 Such a triple bottom line approach focused on economic, social and environmental well-being targets issues related to the environment, economy and society systemically, as a whole, helping communities realise the benefits of development synergistically and effectively. A focus on any one of these aspects in isolation usually cannot lead to the holistic transformations necessary to make them self-propelling for the future. It guides communities to prioritise actions based on their own need and goals and helps them create new lifestyle choices and opportunities to exercise. More important, it helps to suffice their multiple requirements and cope with changing circumstances such as those imposed by changes in the economy, climate or even individual aspirations. 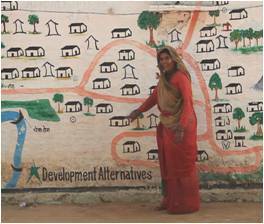 The Hamara Gaon Programme of Development Alternatives reaches out to 18 villages across 4 districts in Bundelkhand – an area proverbially known for its poverty and deprivation – to demonstrate models for transforming lives of people in deprivation. 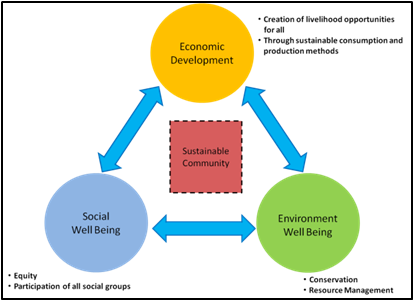 The feasibility of such models could be applicable on a large scale in a variety of socio-economic-ecological context. In our evolving world of resource depletion, climate change and economic stagnation, some of the basic lessons, particularly the key role of livelihoods and of rational management of resources, may be applicable to different geographies across the world.